Bouldering on the Waitomo Limestone. 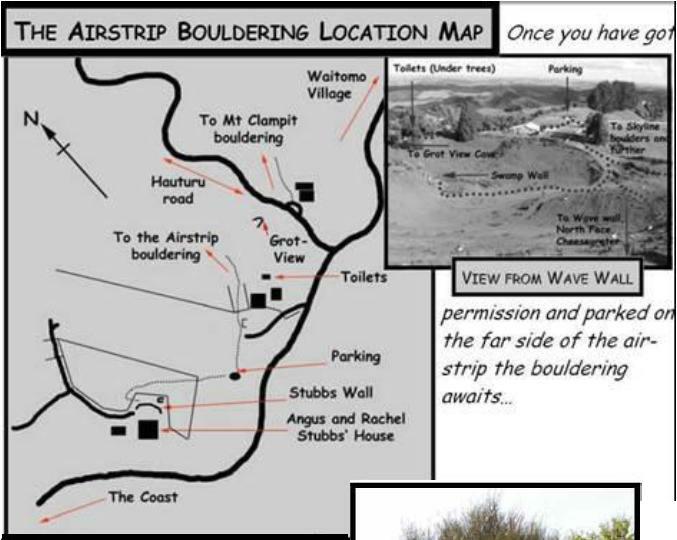 The airstrip excels in low to mid grade bouldering. The best problems are often up to 4m high, and offer a great range of moves although delicate smears and desperate slaps feature often. The Waitomo limestone is generally very solid with reasonable friction, and well featured due to 1000’s of years of weathering. Waitomo is a tourist town so take your pick, Backpackers start at about $20 a night and comes complete with drunken free loving guests. The village camping ground costs about $12pp for camping and also has cabins available. Climbers may be more attracted to the HTG Caving hut 1.5km out of Waitomo towards the bouldering. This is bunk bed accommodation with a communal kitchen and good showers, for $12 a night and comes complete with drunken free loving cavers. Camping is also available here for $7pp. Waitomo village has a pub and bottle store which does basic evening meals. There is also a very average pizza café at a back packers, and the good (though expensive) Long Black Café for coffee, food, and caving tours (!?). The nearest town, Otorohanga has a supermarket and ‘The Thirsty Weta’, a better than average bar/café. By car: Turn off SH3, signposted to Waitomo Caves, 40min south of Hamilton or 10min north of Te Kuiti. The Waitomo caves village is 10 min further on. From the Waitomo Village, head west past the famous caves towards Te Anga and the coast.10-15min onwards passes Hauturu road on the right and 50m on is the access, signposted Awatiro/Stubbs farm. Close the gate on your way though. 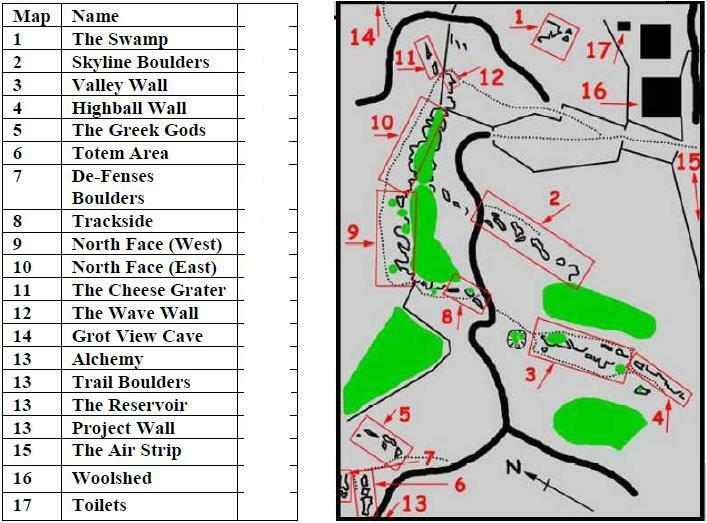 Boulderers have been requested to park on the south side of the airstrip, on your left as you drive in. This is to avoid any obstruction of work at the woolshed and yards. Hosted on www.freeclimb.co.nz. by Cliff Ellery. Written by John Newby with updates from Bevan Jenkins, Dave Addison, James Morris, Sam Williams and Ben Rohde.